James conducts the analytics for each of the client's retirement plans. He mostly works behind the scenes but occasionally you may see him gathering data directly from the client. James' favorite part of his role is being able to learn from the other advisors in the office. He enjoys helping other reach their financial goals for the future. 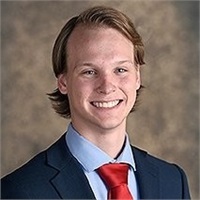 James graduated from Oklahoma State University in 2017 and earned a BSBA decree in Finance. James also completed an internship with Gilhang Financial Group, LLC prior to graduating from college. He is also preparing to complete certification examples for Series 7 and 66. When James is not in the office you may spot him on the ice playing hockey on the weekends with his friends. He also enjoys spending time with his family who is very supportive in his career and ambitions.